The next generation of employee perks. What is a Lifestyle Spending Account? A Lifestyle Spending Account, is like a Flexible Spending Account (FSA), but instead of being a dedicated account for out-of-pocket health care costs, it’s an account that puts perk money in the hands of employees so they can get the perks they want and need most. Lifestyle Spending Accounts (LSA) include perk stipends, which determine the amount, timeframe, and perk categories employees can take advantage of. They are becoming more popular in today’s work climate because they dramatically improve both the process of offering perks for HR team members and more importantly, the experience for employees. Example of a Lifestyle Spending Account. 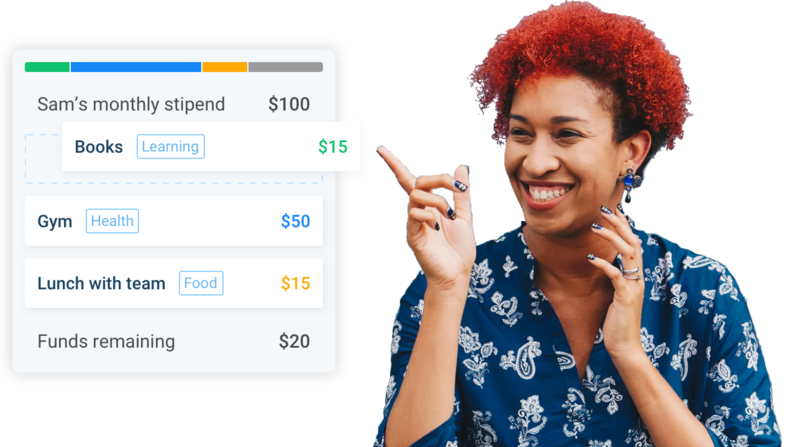 In the example to the left, Sam's company has allocated $100 per month to spend the following perk categories: continuous learning, health & wellness, and food. This month, Sam purchased books, a gym membership, paid for a lunch with her team, and still has $20 remaining. How would you spend your $100 this month? Most companies are shifting towards giving their employees the freedom to choose their own employee perks. Airbnb: $2,000 a year to spend on travel. Qualtrics: $1,500 a year to spend on experiences. Facebook: $4,000 in “baby cash” stipend for new parents. Microsoft: Annual $800 “StayFit” reimbursement to pick favorite way to stay fit physically, emotionally, and financially. Basecamp: $100/month for health and wellness, $100/month for massages, $1,000/year for continuing education, $1,000/year for charitable giving with matching. Buffer: $20/month for continuous learning, $3,000/year dependents grant, and $200/month remote work stipend. Circle: $200 a month to spend on lunches. Whether you're creating a perk program from scratch or looking to make significant improvements to an existing one, adding personalization to your perks program can achieve many of the same goals that traditional perk programs do, while giving you more benefits. Want to read this content later on, share with others, or present it in a meeting? Then download the free eBook. 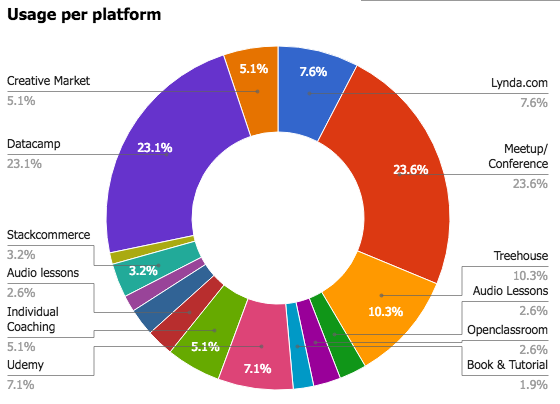 The various platforms used by Buffer's team for their $20/month Continuous Learning stipend. As mentioned above, Buffer offers their employees a $20/month continuous learning perk stipend. After analyzing their employee's usage of the perk stipend, they noticed that their employees were using many different platforms to learn. 15 unique platforms to be exact. How could an HR or People Operations professional create a program that supports this diversity of need? This perfectly illustrates the power of a perk stipend. This new approach to employee perks has been gaining a lot of media attention lately because they solve so many common problems of traditional perk programs, and they also address so many trends for the future of work. So what exactly are the benefits for companies and employees? Lifestyle Spending Accounts help employees to get what they want and need most. Pet insurance, in-office yoga, and financial planning services are excellent perks, but often only a small percent of a team will use them. Lifestyle Spending Accounts create a 100% personalized perk experience. Solve for all employees, not just ones located in local HQ. In-office and remote employees alike love LSA's. Resources-saving. HR no longer is forced into trying to pick the "perfect perk" with their limited budget available. Decrease the administrative burden on HR. Less time-consuming and labor intensive tasks, and more automation. Always IRS compliant. Finally, your CFO will be able to sleep comfortably at night knowing your perks are appropriately taxed. And, they have you to thank for that. Make the most of every company dollar spent on perks. With Lifestyle Spending Accounts, companies no longer experience expired food, wasted event tickets, or under-attended in-office fitness sessions. Encourage a more equal distribution of perks and who they solve for. Beer might sound like a great idea, but what percentage of your team actually likes beer? Avoid usage for the sake of usage, start saving money and resources by offering more meaningful perks to everyone. Better align with company mission, vision, values, and goals. Gain a competitive edge by approaching perks strategically and aligning them with what matters to the business. Find more in-depth review on the benefits of Lifestyle Spending Accounts here. When do companies consider using Lifestyle Spending Accounts? Want to offer perks that offer any of the benefits mentioned above (e.g. personalized, cost-effective, scalable, cater to remote teams, and want to be IRS-compliant). Want to offer more comprehensive and diverse perks to their employees without actually have to purchase and manage individual perks and perk vendors. Why invest time researching, buying, and managing pet insurance or in-office smoothie bar, when only 5% (or less!) of your team will use it? Want to offer perks, but don't have a lot of money to offer them and time to manage a personalized perks program. Setting up a traditional perk program from scratch takes seven steps and many months to do it right. Lifestyle Spending accounts aren't too far off, but the process is much easier and in the end, employees are much happier. 1) Identify your current number of employees and your total budget for employee lifestyle spending accounts. 2) Determine how much you'd like to spend per employee per timeframe. Timeframes could be monthly, quarterly, semi-annually, annually, or a one-time basis. 4) Set up your program. If you use a perk management software like Compt, this could take 15 minutes. If you're doing it manually - develop a spreadsheet/form where you can manually track the individual perk expenses, total amounts remaining within each time-frame, collect receipts, account for taxes, data for finance, and status of each perk expense. 5) Last, but not least, communicate it to the team. Draft up an email, or better yet, a page on your internal wiki to communicate the new perks plan. Remember to explain the why, what, when, and how details. Lastly, supercharge your communication plan by creating a forum for people to provide feedback, whether it's a form for them to complete or holding a series of office-hours. Curious what people actually spend their perk allocations on? We've pulled together some actual purchases from users of our Compt software. Want a more comprehensive list, check out our ideas for perk spending page which also includes suggestions for spending. Want to learn more about Lifestyle Spending Accounts? We've got you covered. We're here to talk through your company's current goals and challenges with perks, and see if LSA's can help your company achieve greater success.